Why did humans ever start practicing agriculture? It’s not self-evident as it might seem to us. Anatomically modern humans emerged 200,000 years ago, but did not start practicing agriculture. Humans were smart enough to make boats, flutes and cave paintings tens of thousands of years before they ever started to engage in agriculture. It took until about 12,000 years ago for some people in the Middle East to embark on this endeavor, a few thousand years later agriculture then began to emerge in other places around the world, in what we know are independent events, using entirely different plants. So why did this happen? There are a number of different theories by people who did a lot of research on this topic. Most of these theories attempt to explain the direct process of a particular group of people transitioning to agriculture. Demographic explanations exist which propose that population density in some particular area of the world became too high to survive by hunting and gathering, forcing people there to engage in hard labor to increase the productivity of their environment through agriculture. Other explanations suggest that people engaged in agriculture to store food in preparation of big feasts, while yet others suggest that agriculture was the process of a continuation of evolution. These are interesting suggestions, but they don’t explain the bigger mystery, why it took so long for the type of conditions to emerge that could produce such an outcome. Surely people 200,000 years ago could have prepared for a feast or suffered overpopulation? Why didn’t they make the transition? One suggestion has been that something changed in our environment that enabled us to make this transition to a new way of living that had hitherto been impossible to sustain. We don’t know the exact date when people began to practice agriculture, but we do know that the climate changed rapidly around 12,000 years ago, as we left a glacial period and entered an interglacial period, a period of relatively high temperatures within an ice age. Afterwards, the first signs of agriculture emerge in the archaeological record. Other places that don’t demonstrate signs of agriculture yet do begin to display signs of sedentism. About four degree Celsius separates the Holocene from the preceding Pleistocene. In the 21st century, we expect to see a temperature increase somewhere between two and four degree Celsius too. 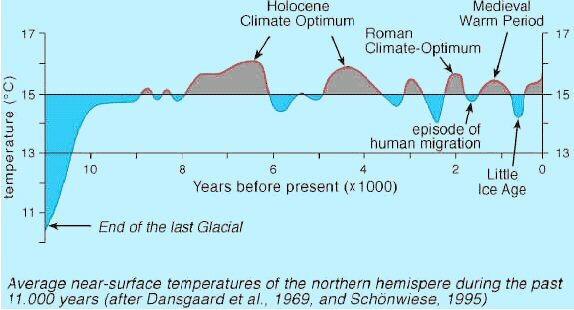 The most important factor that makes the Holocene different from the Pleistocene is climatic stability. What matters most is not the average temperature in a particular region over a long period of time, but the year to year fluctuation between temperatures and precipitation. If the amount of rain that falls this year is relatively similar to the amount that falls next year and temperatures remain similar too, it’s relatively easy to use a single crop. On the other hand, if the amount of rain that falls varies significantly or temperatures vary a lot, plants that perform well this year may not perform particularly well during the next year. The type of dependence on one particular crop we see for much of recorded history does not make sense under such conditions. In addition, human population is likely to vary a lot between different years. A series of bad years may cause a population to decline a lot, but a series of following years may deliver people with plenty of food. Population may recover during those years, but with plenty of food naturally available, people would have no need to begin to engage in agriculture. Note also that the first steps of plant domestication likely did not occur consciously. People through their natural activities simply propagated seeds of plants they ate a lot, which caused plants to survive that were more edible. In an environment with a lot of humans who eat a limited number of plants, such selective pressure on plants is very strong, but perhaps not strong enough in a more variable climate. Richerson et al provide some interesting graphs that illustrate just how unstable the temperatures of the Holocene must have been compared to the temperatures we experience today, show below. 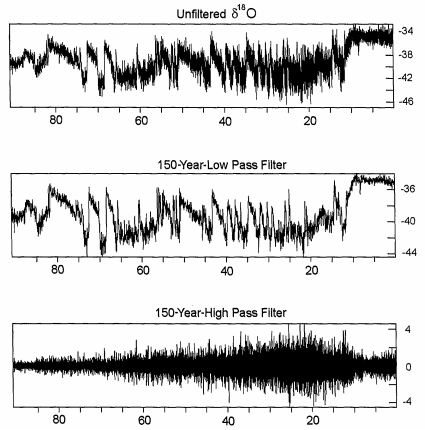 Above we see the amount of temperature variability over periods longer than 150 years on the low pass filter, with the amount of variability over periods shorter than 150 years visible on the high pass filter. The Holocene is relatively easy to distinguish on the right side of the images here. Two more interesting graphs. 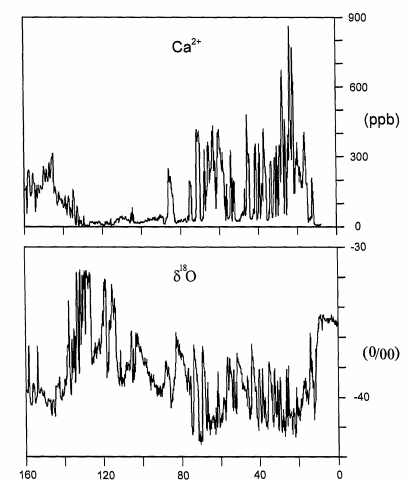 The bottom graph shows Oxygen ratios, used as a proxy for temperatures in the area where ice core samples are taken.The graph above shows the amount of dust in the air. Note the almost complete absence of dust in the last few thousand years, compared to periods in the Pleistocene, indicating a relatively peaceful and hospitable environment, without a lot of dust reaching Greenland. So, in conclusion, the evidence suggests that we’ve had a relatively stable and peaceful climate for the past 12,000 years or so. Understanding how unstable temperatures can be over short periods of time and the effect it had on our ancestors might help us appreciate the relative stability we inherited a bit more. We can’t see Glyptodons and Mammoths with our own eyes and we have to sit in cubicles and stare at computer screens all day long, but we can generally sow seeds with the knowledge that enough rain will fall and temperatures will probably be stable enough for plants to grow. There are other factors in the climate that can affect agriculture besides temperatures and the amount of wind and rain, although these are probably the most important factors. Different atmospheric CO2 concentrations have varying effects on plants, some of them positive, others negative. At higher concentrations, some plants become more vulnerable to the effects of insect plagues and interactions between plants and fungi change in ways that can be problematic, either for the plants themselves or for animals that wish to feed on them. These factors are mostly outside of the scope of this article, although I look into them a bit more in some other posts on this blog. Now that humans are changing the climate, it’s often dismissed as a problem by people who suggest the climate has always changed in the past. This is a lie of omission, because it omits the important fact that our modern way of life emerged in a period of unusual stability. There are reasons to believe that temperature and precipitation fluctuations will increase again in the future for large parts of the planet. The year 2014 was very unusual, because the United States saw both extreme cold and extreme heat simultaneously in different parts of the nation.2 Why did this happen? The jet stream normally prevents very cool Arctic temperatures from escaping further south. However, because temperatures in the Arctic increase much faster than in the rest of the world, the jet stream weakens and begins to meander.3 What happens as a consequence is that unusually cold temperatures can occur further south and stay stuck for weeks. This is unpleasant for humans, but also potentially dangerous for agriculture. Global temperatures have so far increased about 0.8 degree Celsius above the pre-industrial average, but are likely to increase much further, with current plans aimed at keeping the temperature increase below 2 degree Celsius. Thus the increasing instability we have seen so far is likely to get worse in the decades ahead.